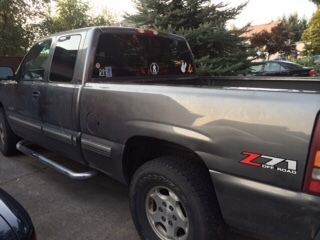 2001 Chevy Z71 Parting Out, Spokane, WA. I am using the engine, harness, ecu and related parts for my build, but the rest of it is up for grabs. The removal of the engine will be surgical, so everything the is left over should be intact and sold off locally, on eBay, or online. I’m selling stuff here 1st. This is a runner driver, fully functional rig- but we cannot get the title due the PO’s bitter divorce. I paid him for the truck, but promised to share the money of whatever sells off since he’s marrying into the family and he’s a good guy. BUT I won’t be getting to parting it out until Spring- after I heal from surgery this December. Heavy Items can ship via Fastnal for around 150.00 for freight cost. You have to have a Fastnal close by. You can also come pick up the parts. Larger parts- Bed, Cab, axle, etc. Would require you to arrange for pick up here in Spokane. Interior pieces prices vary by part. You can call dibs on any of the parts, payment required by PayPal, or money order via mail to secure your parts. Again, I physically can’t pull parts until April, or May. If you want the whole truck, minus the engine/ecu/pcm and related components, let me know and we can do that, too- but no title. I’ll get more pics tomorrow.